Golf in Thailand measured by numbers of players, rounds played, and equipment sold could be generously described as flat this year. While some golf tour companies are seeing increases in arrivals, the number of rounds played at Thailand golf courses overall are 30% off from last season. Why the slowdown in the game’s growth and where is it headed? First of all, the good news for golfers who like to take golf vacations. Just look at how many people are discovering Thailand as the premier affordable Asian golf destination, if not the world, in spite of instabilities. For example, over the past 3 months more than 35% of Thailand golf tours originated from the USA. This compares to only 15% the year earlier and is amazing considering the ongoing economic crisis in the States. Traditional golf vacation destinations for Americans such as Scotland, Ireland, and Spain have become prohibitively expensive for those getting squeezed by the faltering economy and/or are unattractive for golfers seeking the best golf holiday deals. So if Thailand is such a great destination for golf traveler, what is causing the declining interest locally? In my view this centers around three challenges. 1. The increase in the cost of golf. There is no doubt about it, while still a great deal by international standards, the cost of golf in Thailand is high for local Thais and foreigners living here on fixed incomes. Building and running championship quality courses means more money for land, equipment, suppliers, and staff. Just look at Red Mountain, the most spectacular course in Phuket, if not all Thailand. On a normal day this $160 US Dollar course gets only 20-30 golfers, while it’s sister course Loch Palm costing only $40 US dollars for locals gets over 100 golfers a day. Then there is the cost of equipment. Branded clubs are available in Thailand, but original ones cost up to 50% more than the same ones in the USA. Counterfeit fakes are fine, but who really wants to take a chance. 2. The time it takes to play a round of golf at most Thailand golf courses is getting longer and longer. When I first came to Thailand in 1995 I could get around in 3 hours or less. Now I have to count on 4 and half hours or more to play 18 holes in Thailand. In our fast moving high productivity world the demands on business and personal leisure time have skyrocketed. This means there isn’t as much discretionary time leftover for golf. Moreover, for those with families, 4 or 5 hours away from the kids just is not acceptable. 3. 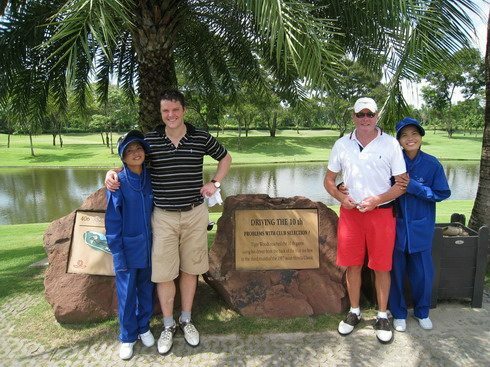 Thailand golf courses are not easy, and when you golf poorly you get discouraged from continuing. The Canyon course at Blue Canyon Country Club in Phuket is rated a 142 slope, fine for Tiger Woods, but hardly fun for local bogey golfers. Too many of Thailand’s golf courses have been built recently where the owner’s sole goal was trying to make it to “Thailand’s most difficult golf resorts list”. (The one exemption to this is the new Jonathan Morrow designed and constructed course next to the Bangkok Golf Club in Bangkok. It being built for fun!) Getting “beat up” and loosing half a dozen golf balls every time you golf in Thailand does not encourage more frequent play, does it? My interpretation of a successful game over the long tem requires that it have some element of enjoyment, in other words fun. So hang in there while the current crop of Thailand’s course designers get over this bump-in-the-road and find out that hard to play courses hardly to justify the investment from a profitable business perspective. In the short term I expect these trends to continue. Over the longer term however, golf in Thailand will reach an tipping point and of the game will get back on track.